Erik Otto is an American mixed-media artist working in the creative disciplines of painting, sculpture and installation. Otto has held exhibitions nationally in New York City, Los Angeles, San Francisco, and Washington DC and internationally in Vancouver, Mexico City, and Berlin. 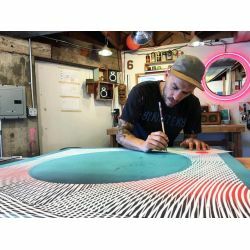 He was selected for the SF Recology Artist-in-Residence Program, received the VSCO Artist Initiative Grant, and produced work for YBCA Bay Area Now 7. He currently has work held in the private collections of the Grand Hyatt, Microsoft, LinkedIn, One Medical Group, and Uber Technologies. Known to take life-changing risks, Otto once self-initiated a 6-month artist residency in Mexico City that resulted in a solo exhibition in an abandoned building just prior to its demolition. "Say no words. Be present. If you feel something, soak it in and reflect on what you feel." "Traditionally an abstract painter, my interest has grown to work in the creative disciplines of sculpture and site-specific installation. As I remained open to exploring new mediums and techniques to create with, it seemed only natural to pursue three-dimensional work as another way to visually communicate. Two totally different mediums, it was exciting how the sculptural work would inform the paintings while the paintings became influenced by what I was doing with shape and form. From doing large-scale murals on location for public spaces, my curiosity sparked in how environment can shape experience and I was compelled to see how I can play a role in altering spaces to invoke wonder and imagination. Everything has been done, but it has yet to be done by me. With all the work I do, I am offering my personal story and influences while combining my multiple interests and disciplines in an effort to bring forth something that is uniquely my own." "Before beginning any new body of work or commissioned piece, I typically begin with plenty of reading, writing, and reflecting. I take my time to familiarize myself with the purpose of the work and consider all the methods before execution. However, too much planning can also stifle the creative process. As an avid risk taker, I firmly believe in the element of chance. Quite often my process includes careful planning followed by total improvisation leaving room for new possibilities to come along the way producing an end result that is much more genuine." "Water & Sky" Meet "Nature & Technology"
Nature Meets Technology "Earth & Rock"